Help us provide Heirloom Vegetable Seeds so people in Haiti can feed their families! We’re working with 2 batches of seeds, enough for nearly 50,000 people! Please see below for an overview of our program. The following events are coming up, please RSVP ASAP! We do Corporate Events! Got Funding & Volunteers? Let’s DO this! This is not comprehensive, so see the Calendar for all events. Read each event carefully to understand what is expected of you. Starting in 2019, we have projects on campus at MDC North. See the UPG Calendar for info, and please make Reservations so we can plan activities. Click here to make your Reservations through the Calendar. Ready to Walk The Walk? These are some of the roles we need to fill. Note age ranges. Children must be prepared to work diligently alongside adults. This will prepare you to train and supervise small groups of Volunteers (usually 6- 10) at Seed Packaging Events. qualify you as a Seed Leader (see below). You must attend Seed Leader Training (it is fairly simple, but requires great attention to detail). Then you will be “on call” when we have an event where we need Seed Leaders. Sign up for a Packaging Event. Children are welcome, but they must be well behaved and prepared to work diligently alongside adults (doing repetitive stuff that might make them bored). This will prepare you to manage bulk seeds, packaging, measuring, planning, staging, storage, selection, ordering, shipping… plus all SEED LEADER skills. You may be part of the Logistics Team at events, managing functions before, during and after packaging. Logistics Training is all “On the Job”. Then you may be asked to commit to specific projects and roles. You’ll also “on call” when we have an event where we need Seed Leaders. Student Leaders provide the backbone of our Campus Chapter. They organize events, recruit other students, provide mission-critical services, and serve as liaisons with the whole Campus Community. All Chapter Leaders serve as Seed Leaders, and take on other roles described here and much more. Commitment is substantial: at least 10 hours per week average. This group is guiding the growth of Seeds of Paradise, including Seeds for Haiti. If you have the skills and resources, and are willing to put in the time, let us know. There will be challenges. Expect to work in many roles. Expect to grow as a human being. Help us take it to the next level. You will be contacting companies requesting donation of funding and supplies, seeds, etc. There may be grant-writing. We are re-packaging bulk vegetable seeds in smaller sizes in Miami for distribution in SW Haiti (in the vicinity of Jacmel), where Hurricane Matthew has destroyed most crops. Distribution in Haiti is via trusted UPG Partners. These vegetable seeds are Heirloom or Open Pollinated seeds (not GMO and not Hybrid), so the farmers can save their seeds and replant them. The types are vegetables requested by people in Haiti, customary foods. Each Seed Set includes at least 10 different types, a mix of greens, grains, beans and other veggies so Haitians can provide their families with a healthy, balanced diet. Seed Sets are in 2 sizes, with enough seeds so that either 20 or 100 people can feed themselves. By saving seeds after harvest, farmers can be self-sufficient thereafter. A partner in Jacmel has food (soup concentrate) so that farmers can feed their families until their crops become a reliable food source. 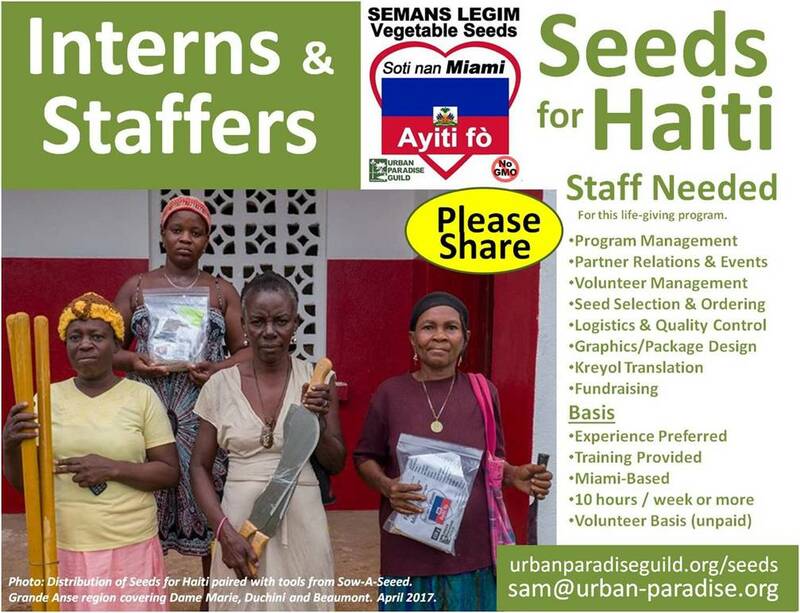 S4H Batch #1: Seeds for ~26,000 people, 18,000+ individual packages (shipped to Haiti on 4/18/2018: see photo link). S4H Batch #2: Seeds for ~24,000 people 8,900+ individual packages (in production now). Each package includes: a mini-ziplock baggie, a label, and seeds. The 2-sided label is very specific to the seed type and volume, with seed name, weight/count, # of people and families served, technical planting info, nutrition info and program. Kreyol is the dominant language (english is in a small font for aid workers). A big heart contains the message “From Miami” and “Haiti Strong” with a Haitian Flag. Illiteracy rates are often 70-80%, so these symbols are essential, saying “Miami loves Haiti, we care, and you have not been forgotten”. The ziplock baggie is sized based on label size, seed volume, Volunteer effectiveness and cost. They are food-quality and 2mil thick for toughness, and long future service in Haiti for seed management and other uses. Packaging and seed costs are substantial. We deeply appreciate the corporate sponsorship of Batch 1 and Batch 2. When they are sent to Haiti, and the materials are exhausted, we must have more funding to continue the program or it will cease. It takes a village to accomplish our huge objectives. This page is still in development and being updated, so if your organization contributed and you don’t appear here, please let us know. Below: Image of the UPG Shipping Labels for “Batch 1” buckets. There were 34 buckets of seeds in Batch 1, each containing seeds for an average of 766 people weighing 9.2kg.